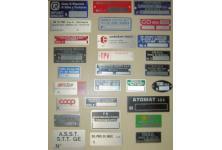 Plates for inventory are ideal to identify sources, to number machinery, company goods as furniture, computers, office accessories and generic devices. They are realized by screen printing technique on anodized aluminium, they are resistant against wear, rubbing and weather also by big temperature excursions. Manufacturing in several forms and sizes, with any graphics or colouring. Available with fixing holes or double-sided adhesive tapes suitable for any surface. Progressive, and also variable numbering.